2005: BGW Taskforce co-chaired by SFPA and Mayor Newsom to develop BGW Vision for connecting parks and open spaces along the city’s industrial eastern waterfront. More than 16 different public agencies and more than 30 neighborhood associations, non-profit organizations, businesses, and concerned residents were represented on the BGW Taskforce. 2006: BGW Vision and Roadmap to Implementation adopted by City of SF. 2008: SFPA helps secure $22 million in funding for BGW projects via the 2008 Parks Bond. These projects include Heron’s Head Park and Cargo Way Bicycle Improvement Project. 2010-2012: SFPA awarded $175,000 from US EPA for an Area Wide Plan to identify brownfield sites for remediation and transformation into parks, trails, and recreation facilities. 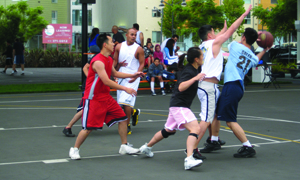 2012: Through Parks Bond advocacy campaign, SFPA secures another $16 million in investments for BGW implementation. 2013: SFPA identified targeted land acquisitions that would help complete the BGW route in India Basin. The last two remaining parcels of privately owned SF waterfront come onto the market: 900 Innes Ave. and 700 Innes Ave; SFPA secures EPA assessment of toxins at 900 Innes, confirming contamination. Results will be factored into lowering the purchase price being negotiated by the City.SFPA continues to lead advocacy campaigns to help the city purchase India Basin sites. 2014: 700 Innes purchased by developer Build Inc., which pledges to work with the community, nonprofits and the City to link any project on the site to the vision of the Blue Greeway; in July the Board of Supervisors gives unanimous approval to purchase 900 Innes for about $3 million. 2015: SFPA is participating in the India Basin Visioning Process with RPD, TPL and Build Inc. The Blue Greenway Action Plan kicked off with an agency update meeting of the 15+ agencies involved on the eastern shoreline.